I found this recipe originally in Fuchsia Dunlop’s amazing Revolutionary Chinese Cookbook, which is the simply best book on the subject of Hunan cookery published in English. 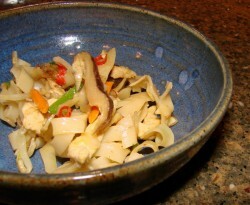 It uses salted chilies, a condiment which is ubiquitous to Hunan, but which is not available in stores here int he US; instead, Dunlop gives a simple recipe to make them yourself. It had been two weeks since I started the chilies fermenting, and now they were ready; of course, I had to use some right away in order to experience the flavor which I had been watching develop for fourteen days. Dunlop’s original recipe only included Chinese black mushrooms and bean sprouts as vegetables; while this minimalism is authentic, I wanted a bit more color and crunch in my version, not to mention a bit more fiber and vitamins, since I was making a one-dish meal. So, I added carrots and snow peas to the dish, sliced into diagonal julienne, and threw in some cilantro leaves for good measure. The only other ingredient I added was a scant 1/8 cup of chicken broth; I have found that adding a tiny bit of liquid to the noodles as they stir fry leads to a velvety texture that is lush on the inside while still being toothsomely chewy on the outside. That dash of chicken broth also adds a measure of chickeny flavor that permeates the entire dish, making it particularly savory in flavor. A vegetarian version could be made by using the soaking liquid from the mushrooms in place of the chicken broth, and by replacing the chicken with either wheat gluten (seitan) or pressed spiced or smoked tofu. I was pleased by the results. At first, I thought that the chilies turned out not to be spicy at all; however, this was just not the case. They were spicy, but the fermentation took their inherent “in-your-face” heat and transformed it into a more subtle, “sneaks-up-on-you” bite, which after about three tastes, I found to be quite enjoyable. This more subtle salty-tangy heat allowed more of the flavors of the chicken, mushrooms and vegetables, all supported by the Shao Hsing wine and sesame oil to shine forth like savory beacons on the tongue. The ginger, garlic and scallion tops all contribute their shimmering nuances, creating an elaborate dance of flavors in a relatively simple, homey noodle dish. This one is destined to be made again and again, so long as the salted chilies hold out. Toss cut chicken with the next six ingredients in a bowl. Allow to marinate for at least twenty minutes while you prepare the rest of the ingredients. Heat wok until smoking. Add smaller amount of cooking oil, and allow to heat for about ten to twenty seconds. 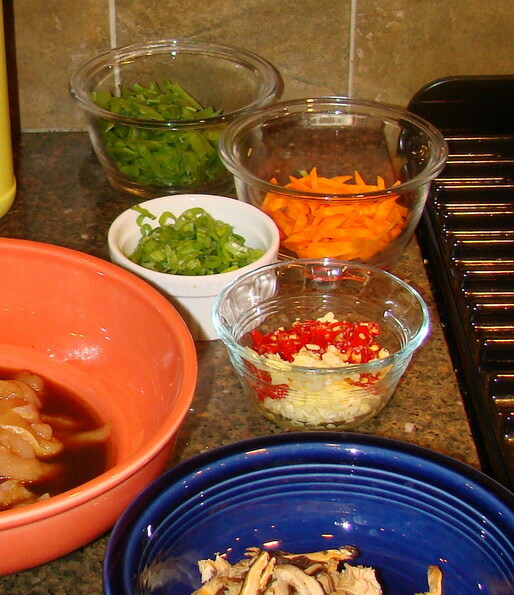 Scoop the chicken from the bowl, leaving behind any liquid marinade that does not cling to the chicken. Reserve marinade. Place chicken in wok, spread to make it cover the bottom of the wok in as close to a single layer as possible, and leave undisturbed to brown lightly for about thirty seconds to one minute. Spread the ginger, garlic and chilies over the top of the chicken. When chicken is browned, begin stir frying vigorously. Add mushrooms immediately, and keep stir frying until only about 1/3 of chicken shows raw pink color; the rest should be white and pale golden. 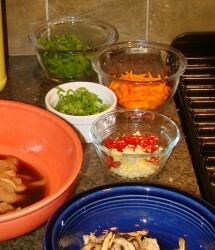 Add carrots, and continue stir frying for about thirty seconds. Add snow peas, and then the drained noodles. If necessary, at this time, you may add oil. (The mushrooms sometimes soak up oil.) 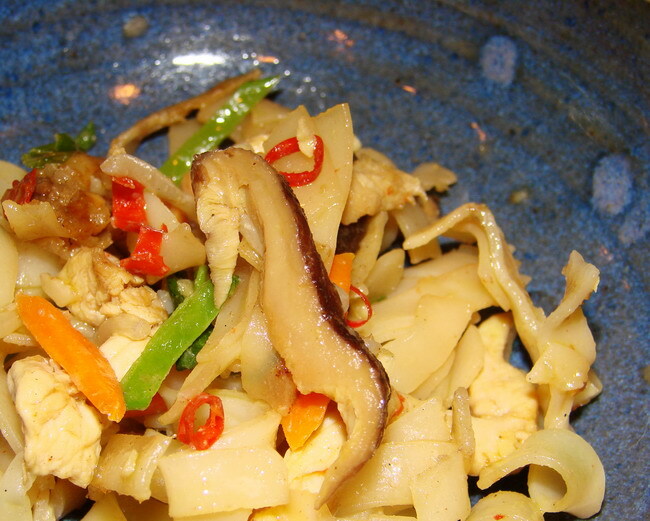 Also, if at any time the noodles begin to stick very much, you may add the rest of the cooking oil to the wok. Splash soy sauce and chicken broth down the sides of the wok and stir fry the noodles until they become softer, and are a delicate yellowish brown color. Add the bean sprouts, scallion tops, cilantro and sesame oil and continue stirring. As soon as the noodles are done cooking, take the wok off heat, and taste. If needed, add more salt and some pepper, stirring to combine well before serving. Serve piping hot, while still imbued with wok hay–the scent of the wok. This will serve four people of average appetites, or three heavy eaters. Leftovers reheat beautifully in the microwave in about two minutes.